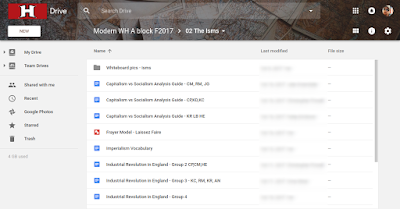 Google Drive seemed like the answer to all my problems until I realized that document permissions can get very complicated as more and more of our learning activities had a strong collaboration component. At first I thought sharing folders via link with editing permissions was ideal. Then, I noticed Team Drive. Team Drive is my new favorite tool on Google Drive. It's easier for students to access because it's right there below "My Drive." This may seem like an obvious feature, but it's an ideal design for students and colleagues who struggle to acquaint themselves with new tools. Here are some of my ideas for using Team Drives. I am currently using some of them and will likely try all of them in the coming years. The note-taking debate is thankfully not that popular. Some say handwritten while others say typed. I say that it's all about how the brain is processing information. Making contributions in a collaborative space is ideal for my students because it becomes about more than jotting down information. It becomes about the contribution to a group and the need to be supportive and helpful. When was the last time such an audience could be a part of your Mead Five Star in real time? Visually representing vocabulary doesn't have to stop at drawings. Choosing images from the Internet is a decision-making process that supports concept formation, for sure. Throw in the student voice that comes with content contributions, and the lesson is halfway to an experience that is likely to be built upon.
" ... click from one to the next using the slideshow that Drive automatically provides." I assign terms to students, and they find images that relate. I encourage them to take risks and be creative with their choices – look for symbols that require viewers to make connections to the term. Then, we open the first image in the folder and click from one to the next using the slideshow that Drive automatically provides. Although the slide show is great for discussion and review, I also post enduring understandings around the room and ask students to walk to the EU that best relates to the term represented by the image. Incorporating movement like total body response are even more crucial to balanced learning routines in the mobile age of the Internet. 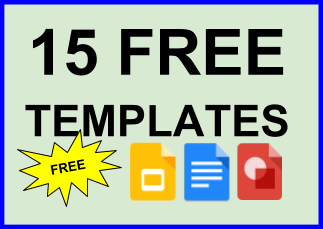 You can make anything interactive with Google Docs, Drawing, or Slides (Sheets, too). Lately, I've been requiring my students to make an interactive quiz to go along with whatever Slides product they've made. 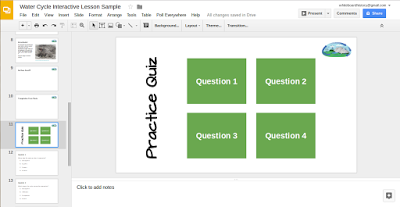 I provide the quiz template with clickable boxes to take users to the questions and provide feedback about the answer choices. The secret is to link text boxes (not the text itself) to other slides in the presentation. This allows more exploration on the part of the user. See also Making Hyperdocs With Google Slides. I still remember the first time a student took out phone to snap a photo of what I wrote on the board. I immediately saw a shift in the works in terms of how notes are taken. For the past four years, I've been taking photos of the whiteboard and placing the image files in a Drive folder. Now that we use Team Drive, I have students name the files as a periodic review. I got this idea from one of my recurring reflections: What am I doing that students could be doing? What do kids bring home from a paperless classroom? This is where the language is going to shift from turning in work to publishing it, as Alan November puts it. Whether the digital exhibit is on a class website, blog, or a site designed to display artifacts, a workflow among the students needs to be established. 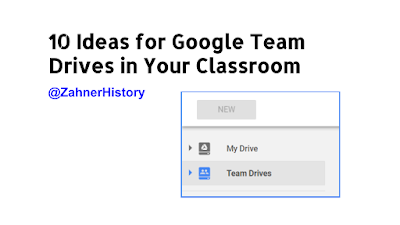 Team Drive is the place for my kids because the file permissions are already set for team member. I never hear "Share it with me" anymore. Our workflow is simple. Folders are made for files to be edited and files to be placed in the exhibit. Students therefore need to be assigned roles and complete more specialized tasks. I use Google Forms to learn about their interests before placing them in a role that will unfairly challenge them. Sometimes the work students do is for the experience, leaving the products sitting in the Team Drive. Over time, these files need to be organized for future reflection and evaluation. Additionally, products made with paper can be scanned and placed in the folder. This is a simple yet crucial organizational task. Digital files can become a mess if neglected, so it's good practice for students to be involved in this process. It helps them with closure and self evaluation on the work they've done. It's also a great time to allow students to rename documents based on their increased knowledge since producing the artifact. Turn your digital file-sharing system into a newsroom workflow. Modify it to meet the needs of a sales staff if you're teaching math. 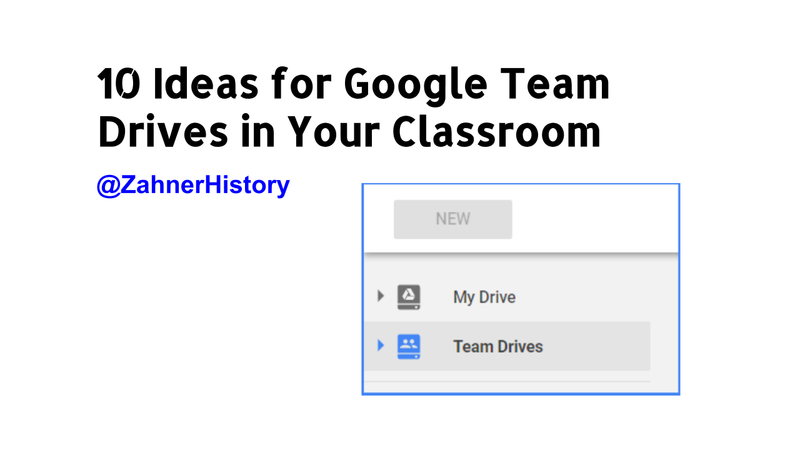 Regardless of the subject, Team Drives can be used to quickly share information without worrying much about the share permissions. What's more engaging than having a voice for the lesson materials? For my teenagers, it's likely many things. But while they are in my class, they may as well contribute to the quality of the content we use to explore social studies concepts. The same could go for a math or science classroom. Digital file organization is a real issue. Make folder to dump readings that students sort and re-sort. Allowing your students to make choices about how lesson materials should be organized can be a powerful learning exercise. It provides teachers with formative observations about what their students need to learn to become more organized. Plus, students can watch their more organized peers make decisions and provide their reasons. For the 2017-2018 school year, my six classes (of differing abilities and grade levels) will work together to organize a Freerice.com campaign. Team Drives will allow everyone access to drop evidence of their contributions (screenshot) and contribute to the marketing of the progress. I don't what this will look like by the end of the campaign, but it will be designed to at least feed people via Freerice.com and provide my students an opportunity to raise awareness of the importance of learning, helping others, and working as a team. Thanks for reading. Please tell us how you use Team Drive.